PRODUCT DESCRIPTION: Clear liquid which can be sprayed in suspected odor areas. May be fogged, sprayed with a pump sprayer, or set out in cups or on cotton balls. It works by absorbing the odor molecules and breaking them down. It also has a slight masking agent which is helpful in some situations. The small product and versatility makes it a good product for small jobs and where the odor may be due to a few reasons. 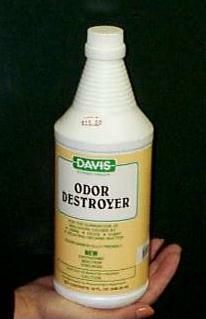 WHERE TO USE IT: Attics, basements, crawl spaces, walls, and just about anywhere the odor is present. RATE OF APPLICATION: As much as needed. Re-treatments may be necessary.